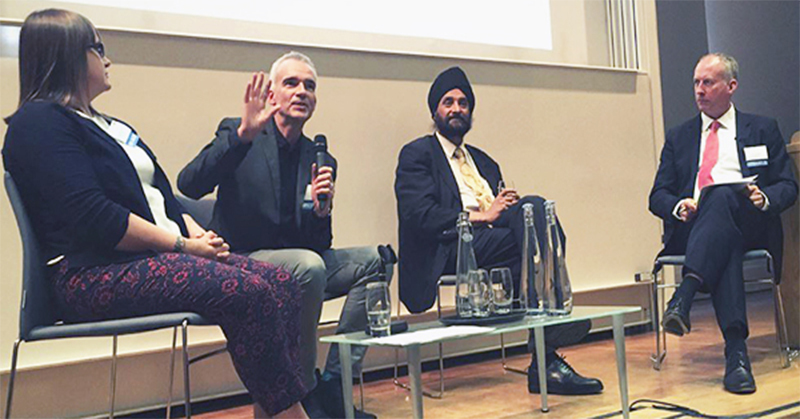 We are living through a "troubling era of the dispossessed" and academics and students must join forces to help find solutions to the global refugee crisis, a PLuS Alliance alumni event in London has been told. Hosted by Paul Ramadge, the PLuS Alliance's Managing Director, the inaugural event of alumni and friends brought together experts from Arizona State University, King’s College London, and UNSW Sydney to discuss the crisis that has seen more than 65 million people forcibly displaced, the highest number since records began. "One of the global issues of the moment is, of course, refugees... we are living in a troubling era of the dispossessed – from Syria to Afghanistan, the Lake Chad Basin, South Sudan, Somalia and more," Ramadge said, adding that Universities were well placed to find solutions. Introducing the panel of speakers, UNSW President and Vice-Chancellor Professor Ian Jacobs told the audience the widely accepted view that refugees were a burden on the economy was "short-sighted"’. “On average [refugees] had higher levels of education than the Australian-born population, greater entrepreneurial qualities – five of the eight billionaires in Australia in 2000 came from a humanitarian settlement background – and often higher levels of participation in paid and volunteer work,” he said. Arizona State University’s Assistant Professor of English Dr Jacqueline Wernimont highlighted the creative and entrepreneurial work being done by migrant communities across the globe, which is the focus of her Collaborative Ecologies project, a PLuS Alliance initiative. UNSW Professor and inaugural Judith Neilson Chair of Architecture David Sanderson explained that most migrants ended up in cities or towns rather than refugee camps, swelling urban numbers and creating a need for 'urbanised' humanitarian responses and aid. The potential bias that religion had on the perception of refugees and what this said about a community’s sense of social justice was explored by Professor of Law at King’s College, Satvinder Juss. Professor Jacobs said universities could play a major role in correcting misconceptions by helping to raise awareness and highlighting misinformation and miscommunication around refugees. "Universities are not only institutions for learning and for research but also agencies for social justice and policy improvement and active, positive change. “It is so important for the PLuS Alliance to bring together influencers like these to discuss key issues of significance to open dialogue and collaboration to find solutions to this global crisis – one of the key objectives of the PLuS Alliance is to forge these often difficult but imperative conversations as a start to find solutions." The Alliance’s focus on refugees and migrants was part of its pursuit of innovative solutions for global challenges in the areas of sustainability, global health, social justice, and technology. “Cross-border university collaborations are not new," Paul Ramadge said. "This Alliance is, however, the first to combine the capabilities of top-tier researchers and educators from Great Britain, the United States and Australia to redefine 21st Century education and bolster efforts to solve some of the biggest global challenges."